As part of the above-mentioned program commissioned by the Agency for Cultural Affairs, we provided a seminar titled “Challenges and Issues to Wall Painting Conservation” from October 30 through November 2, 2017. 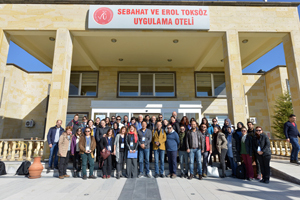 The seminar held at Nevşehir Hacı Bektaş Veli University attracted 30 conservators and restorers from 10 national conservation and restoration centers in Turkey. This seminar aims to review the existing emergency procedures, which are important in conserving mural paintings in Turkey, as well as to establish the protocol. For this first seminar, we delivered introductory lectures on “Mural Painting Techniques and Main Causes of Deterioration,” “Principles in Conservation and Restoration” and so on. An opportunity provided to exchange opinions on lectures between lecturers and trainees resulted in motivating the members to work on challenges together in a united effort. 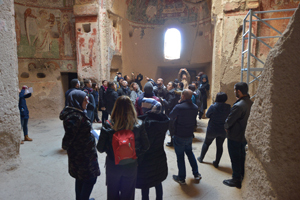 On the last day of the seminar, we visited Tagar Church (St. Theodore Church), where on-site training is planned from the next year, to check the conservation state of the mural painting in the church based on the knowledge learned from the lectures delivered to date. We discussed how emergency procedures should be as important steps in conserving and managing mural paintings unlike general conservation and restoration projects, eliciting a variety of views from them. At present, a system to conserve and manage mural paintings well has not been established fully in Turkey. It is important for us to proceed with this program in step with the Turkish government. Before starting this seminar program, we visited the Ministry of Culture and Tourism, and the Department of Conservation and Restoration of Cultural Properties, Faculty of Fine Arts, Gazi University to exchange opinions for enhancement of the seminar program. Four training courses will be provided by 2019. We hope to build up a practical and feasible system for experts engaged in conservation activities for cultural properties by all the members attending these seminar courses.